In a competitive job market and being new to Canada, many Syrian refugees, like other skilled newcomer professionals, find it difficult to secure a good job and connect to employers that are hiring. This was the catalyst for the creation of the Syrian Refugees Jobs Agenda in December 2015, a roundtable convened by Senator Ratna Omidvar, then Executive Director of the Global Diversity Exchange (GDX) at Ryerson University’s Ted Rogers School of Management. Roundtable members are representatives from different sectors in the Greater Toronto Area – business, government and non-profit organizations – all focusing on identifying employment opportunities for Syrian newcomers and matching their talent to the needs of employers. Like many refugees, finding a safe place to live for his family was Wael’s number one priority. He found that when he came to Canada. His next priority was being able to live and work so that he could provide for his children and give back to the country that so generously opened its arms to him. “At first my private sponsor they help me out…because I have nothing… I don’t have work, I don’t have money…they help me to resettle,” explains Wael. 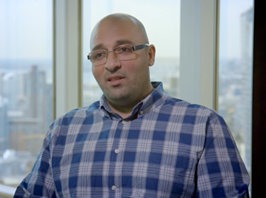 An accountant by training, Wael quickly realized that finding a job that was compatible with his knowledge and skills required some extra help. It’s been a little over one year since the roundtable first convened. And its had many positive and measurable impacts on identifying and creating employment opportunities for Syrian newcomers that arrived as refugees. Job Fair – members of the roundtable put together a job fair in June that included 24 employers with pre-identified vacant positions and an intent to enthusiastically look for candidates to fill those vacancies. Many of the Syrian newcomers who participated were presented with their very first job opportunities in Canada. Construction Trades Program – roundtable members ACCES Employment, in partnership with the Labourers’ International Union of North America (LiUNA!) and the Refugee Career Jumpstart Project (RCJP) created an initiative to support Syrian jobseekers’ entry in construction-related occupations. Participants receive sector-specific language training, pre-apprenticeship opportunities, and direct access to jobs in the construction trade industry. Syrian Refugee Fund Project Grant – a sub-committee that formed from the roundtable led to a new project between Magnet, ACCES Employment, TRIEC and the United Way of Toronto and York Region (UWTY). The project includes: the creation of an employment network hub for Syrian refugees, and developing online tools to support the integration of Syrian refugees into the Canadian workplace. Employment focused and action oriented, the diverse network of 40 organizations from both private and public sector is a successful strategic effort and is still going strong. The Kick-Starting Employer Action guide is a simple, easy to follow resource to help other communities start similar initiatives. In the guide you will find the roundtable makeup, roles and responsibilities, desired outcomes and ingredients for success. There is also a snapshot of how newcomers can address labour market needs in key sectors – with quotes from participating members. Watch now The video of Wael Haddad speaking about his experiences.